We are pleased to announce the release of HelpSmith 7.4 (which you can download from our website) that adds a syntax highlighter feature allowing you to write and format program code according with the style schemes for various programming languages. While you can easily copy a piece of code from your development tool and then paste it into a help topic in HelpSmith, the new Syntax Highlighter feature allows you to format the inserted code according with the styles used for a specific programming language. This, in turn, makes the code easy to read and look similarly to its appearance in the development environment where it was developed. The Syntax Highlighter feature allows you to use HelpSmith to produce API documentation, program specifications, help files with code examples, and any other kinds of documentation containing program code written in various programming languages. 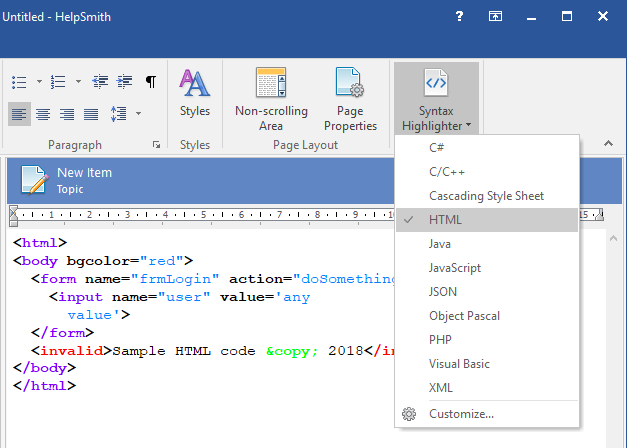 When you need to apply syntax highlighting to program code in a help topic, you can simply select the code in the HelpSmith’s text editor, and click the “Syntax Highlighter” button available on the Write tab in the Ribbon. Please note that the “Syntax Highlighter” button applies formatting for the programming language that was used for the last time. To select the programming language that you need, click on the “Down” arrow in the bottom area of the “Syntax Highlighter” button and select the language from the popup menu. 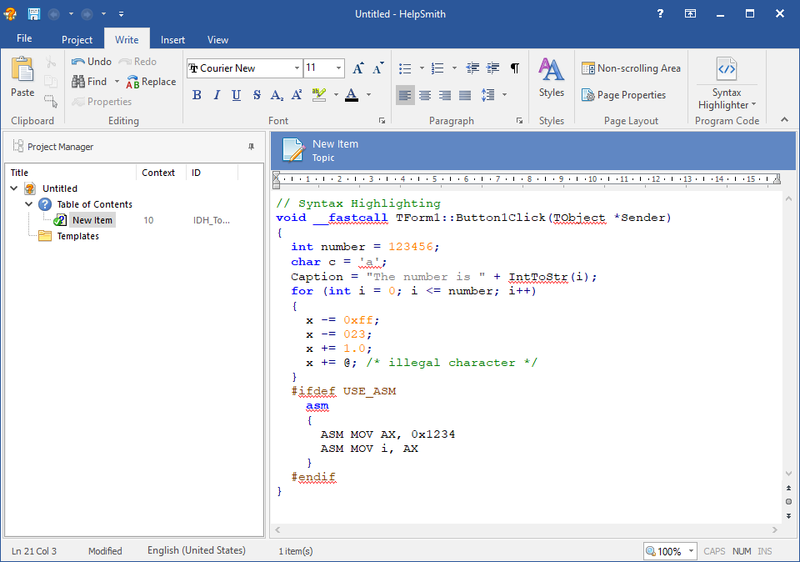 By default, the popup menu under the “Syntax Highlighter” button displays only a limited set of popular programming languages, such as C++, C#, VB, Delphi, PHP, HTML, etc. However, you can also click the “Customize” command to check (or uncheck) the languages that should be displayed in the popup menu. This allows you to show only the languages that you are working with and hide unused programming languages. 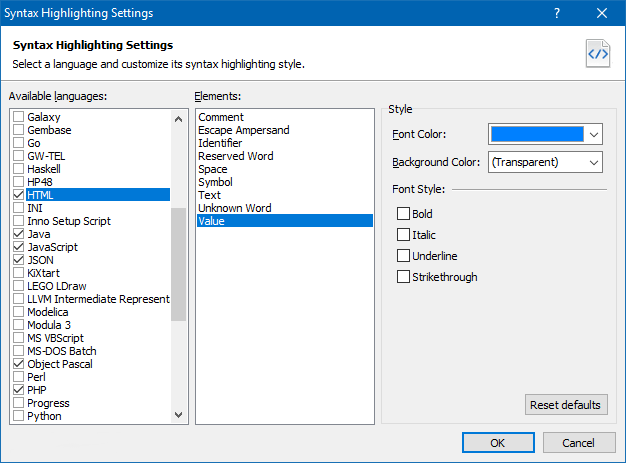 The Syntax Highlighter in HelpSmith allows you to customize the style schemes used for the supported languages, meaning that you can specify how to format the elements in a specific programming language, such as reserved words, variables, comments, and so on. Thus, for a specific element in a programming language, you can change the formatting attributes including font color, background color, and text decoration settings, such as bold, italic, underline, and strikethrough as well. Added the option to disable icons in the Table of Contents in Web Help. Other improvements and minor bug fixes. You can download the latest HelpSmith version here.